A shed roof has no gables, ridges or valleys and looks like a single sloping pane. It is simple, which makes it well suited for an ultra modern style home. A house with a shed roof has a distinct appearance that makes it look unique. Since the shed roof design is not complicated, it is also more affordable and quicker and easier to build than more traditional roof designs. The long slope of a shed roof also makes it ideal for solar panels. 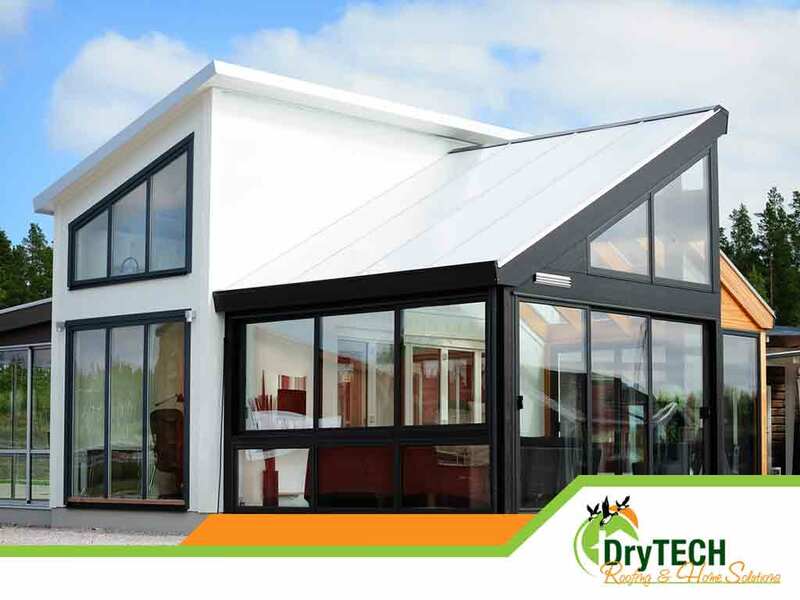 As one of the top roofing and siding contractors in the area, DryTech Roofing LLC knows all about shed roofs and other roofing types. We believe that shed roofs have a few disadvantages that you should be aware of. They do not look good on all kinds of architectural styles and they can develop drainage problems if they are not designed correctly. Shed roofs also require enough insulation to keep the interior comfortable during summer and winter. When built and installed correctly, however, shed roofs look good and perform well. We can help you with all of your roofing and siding needs. DryTech Roofing LLC is one of the few companies to have earned the coveted GAF Master Elite® contractor certification. The requirements for this certification are rigorous, ensuring that only the best contractors can earn it. This certification shows that we know how to repair, maintain and install any kind of GAF roof. We are also siding specialists and we can install James Hardie® fiber cement siding and vinyl siding. As one of the leading roofing and vinyl siding contractors in the area, you can count on DryTech Roofing LLC for all of your siding and roofing needs. We use only the best products for our projects and we go above and beyond for our customers. Call us at (240) 491-5600 to learn more about our services and products or to get a free estimate. We serve homeowners in Maryland.